The First Day of School is one of my favorite days of the year, especially at the middle school level. Everyone is dressed to impressed, whether that be a cute new skirt with coordinating lipgloss or the strategic just-rolled-out-of-bed-but-not-really look. They are checking out each other, their teachers, and most of all, themselves. Since I do not have regular classes on the first day, I love going around and snapping pictures of students and teachers. These are so much fun to share in the last few days of school--so many changes happen in 10 months! Even the teachers often have very different hairstyles by the end of the year. 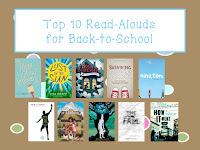 To start the year off on a positive reading note, I am recommending my Top 10 read-alouds for this school year. I have another list like this from 2013, so this list focuses on books released within the past couple of years. Pressed for time? Yeah, we all are. If you worry about finishing a read-aloud, try reading the first chapter or two aloud as a "taste" rather than reading the entire book aloud. Read-aloud excerpts are another great option. I used SlideShare for the list this time, so it could easily double as a beginning-of-the-year booktalk for teachers and librarians. Enjoy! 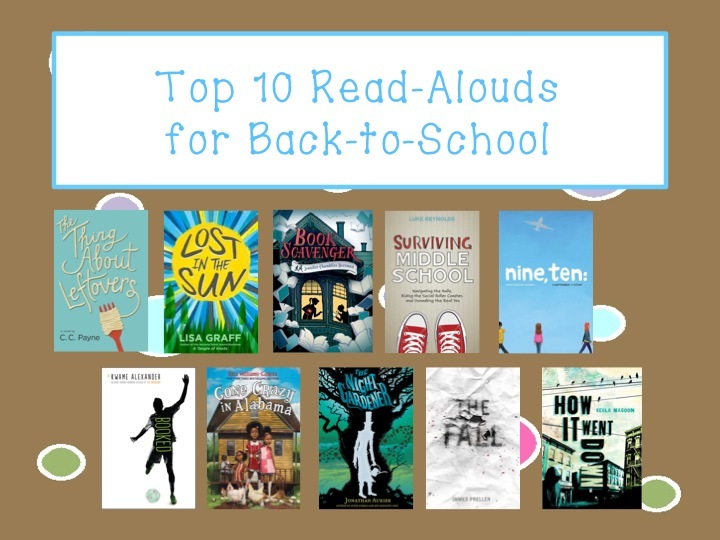 Hundreds of read-aloud suggestions, sorted by grade level and age. Includes 10 age categories from infant to adult. This is similar to the above list, but it contains slightly older titles. If you have trouble finding the newer books above at your library or are looking for less expensive titles, you may have better luck with the 2013 list. When we have three days in the first week of school, I can squeeze all three grades into the library. This year we only have TWO days, and I'm not sure how that's going to work! I would love to get out of the library, but I don't see it happening! Good luck this year! We have TWO days in the first week this year! I kind of like that though because two days back, then two days off, sounds perfect. Have a great year, Ms. Yingling! I'm thrilled that THE THING ABOUT LEFTOVERS made your list! Thank you! I'd be delighted to mail you a signed copy of the book, if you'll email your address to me at AuthorCCPayne@aol.com . And may I just say that I SO admire your brave, adventuresome spirit--a year in China!--WOW! Enjoy! Hi, C.C.! An autographed copy would be amazing! I'll have to have you send it to my sister in the USA since mailing to China can be unpredictable. Will send an email this morning. Thank you so much!